Organized by Akemi Nishidera of Kozo Studio to support the Printmaking Department at Ontario College of Art and Design. The concept: a colouring book…for adults. 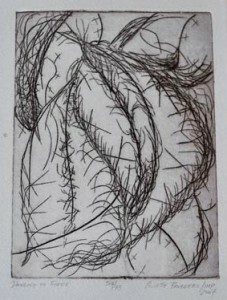 The Anthology of Printmakers (2008) is both a handbound edition containing prints from 30 prominent Canadian artists as well as a copy edition of the prints. The original limited handbound editioned book of prints sells at $300.00 (less than $10 per print!) and copies sell at $25.00. 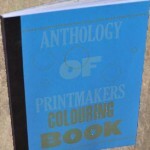 Profits for “The Anthology of Printmakers Coloring Book” support the Printmaking Department of O.C.A.D and the Artists Health Centre Foundation.